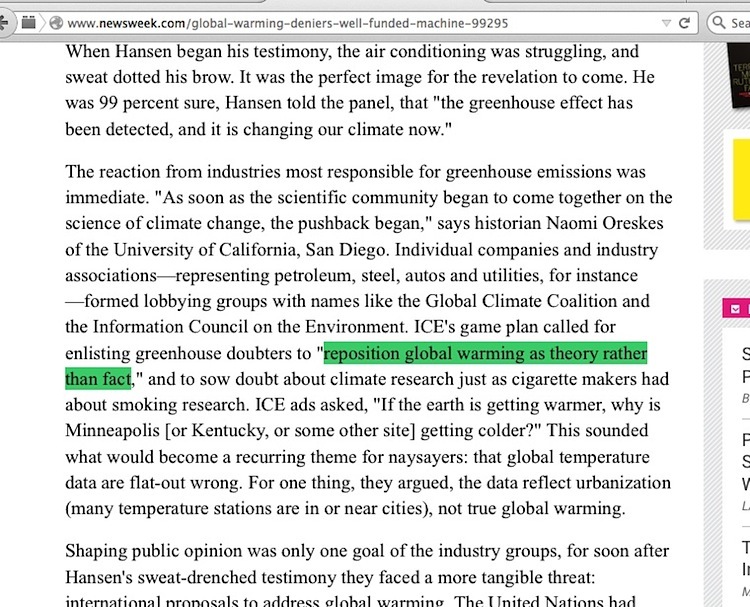 A timeline of where, how and when that “reposition global warming” phrase first appeared and where it prominently pops up afterward is something global warming believers would hate, since it might prompt a total loss of faith in the validity of that central accusation point. The loss could cascade into questions of whether the science actually is settled in the face of skeptics’ science-based criticisms, and people may also start to wonder about the ‘fair media balance’ idea, since they might not readily recall instances where skeptics actually received that from mainstream media reporters. One thing to always keep in mind about the “reposition global warming” phrase accusation against skeptic climate scientists is how it is literally all that Al Gore and his followers have to prove skeptics are corrupt. None of them have ever proven a pay-for-performance arrangement exists between skeptics and industry funders, nobody mentions any in-depth details about the leak of the memo containing that strategy phrase, and no accuser ever attempted to show the collective ICE campaign memos to the public before my work appeared online. 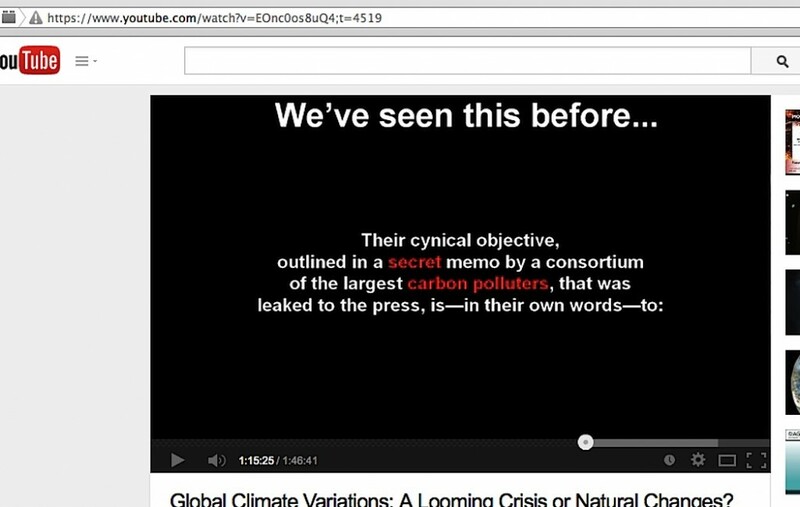 As can be seen below, one of the biggest problems is Al Gore’s 2006 claim that Gelbspan discovered the memo containing that phrase, but Gore himself quoted from that same memo set years before Gelbspan first said anything about it. 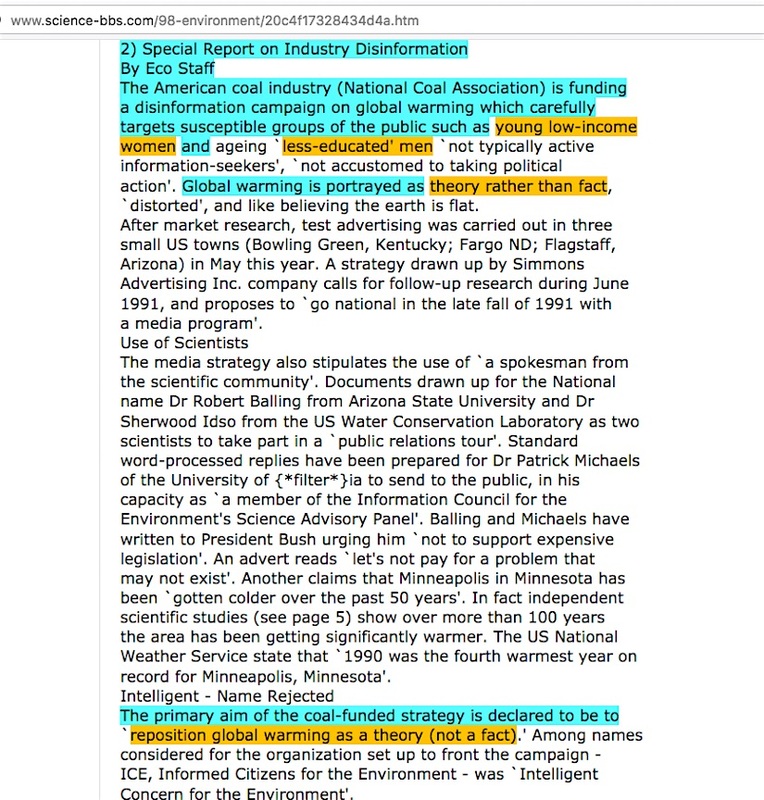 The first news outlet to mention the ICE campaign in any manner was the May 24, 1991 article in the Flagstaff Arizona Daily Sun, “Global warming ad campaign termed irresponsible.” It did not, however quote anything from strategy/targeting memo set because the reporter was quite likely unaware that it was falsely attributed to the ICE campaign. 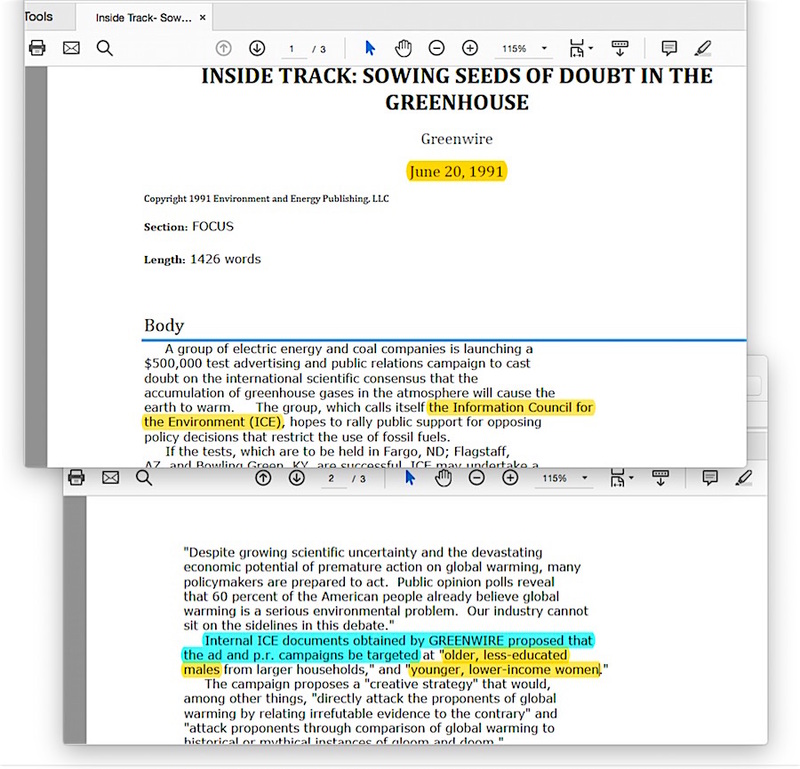 Phil Shabecoff’s Greenwire electronic news brief sharing service was the first media outlet to quote that memo set, specifically the targeting phrases in its June 19 1991 “Inside Track: Sowing the Seeds of Doubt in the Greenhouse” brief. More on that situation here. 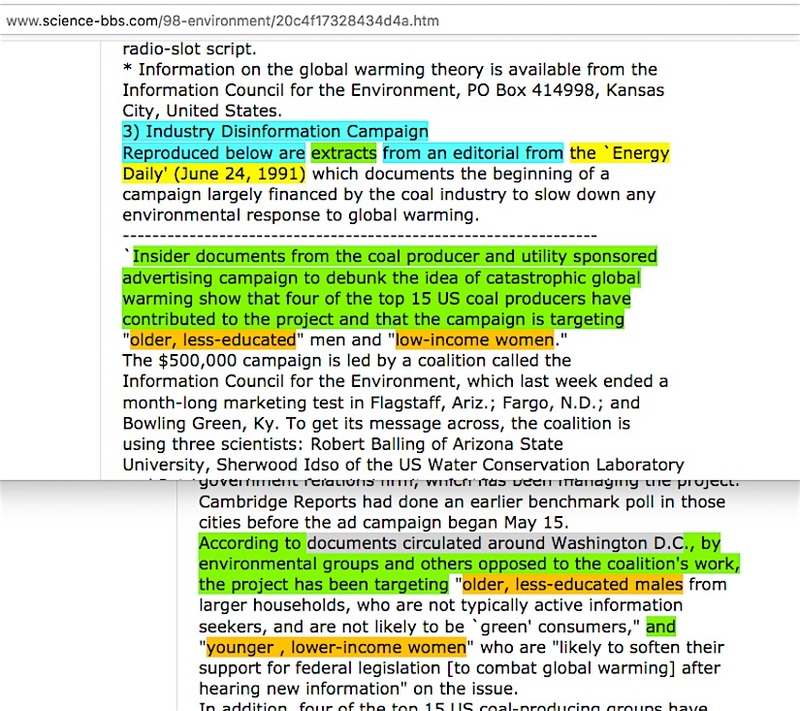 A June 24, 1991 Energy Daily article had specific ICE memo phrases in its title “Greenhouse ads target ‘low income’ women, ‘less educated’ men” and within its content. The June 25, 1991 Eco Geneva newsletter quoted the strategy/targeting memo phrases while additionally reproducing extracts from the above Energy Daily article. 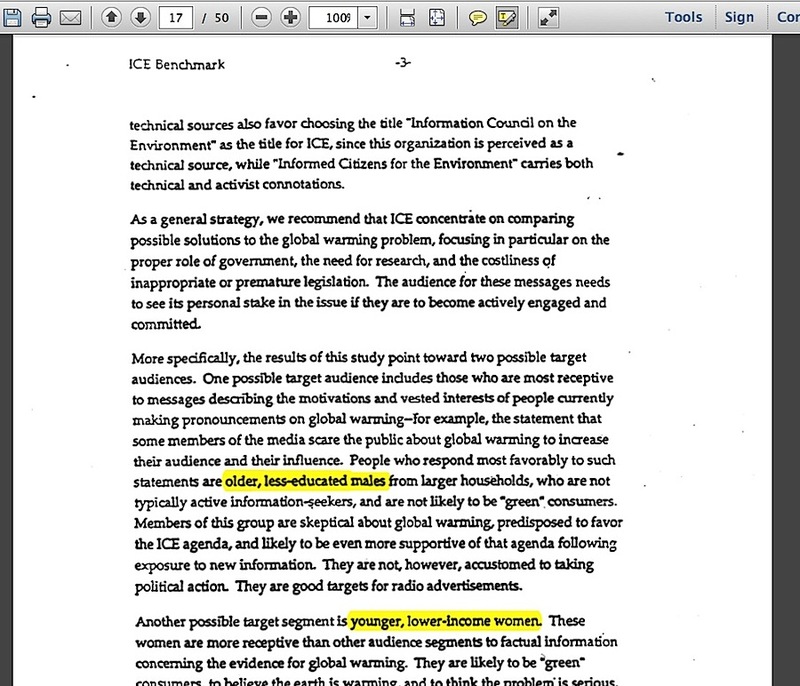 The July 8, 1991 NY Times article about ICE, specifically repeated the “reposition global warming” phrase, saying it had received copies of the ICE memos from the Sierra Club. 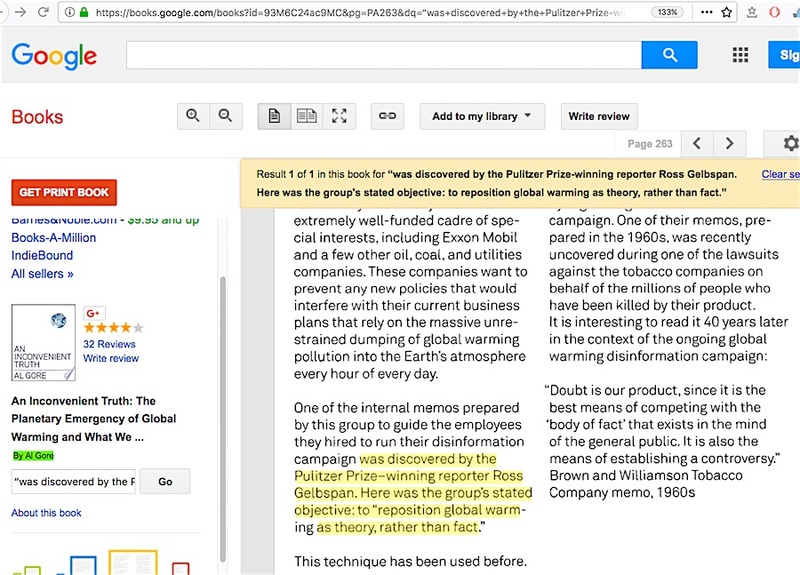 What little that can be seen at a Google books search of the June 1992 “The Greenhouse effect”, Volume 64, edited by Matthew A. Kraljic, shows the identical wording of the July 8, 1991 NY Times article. 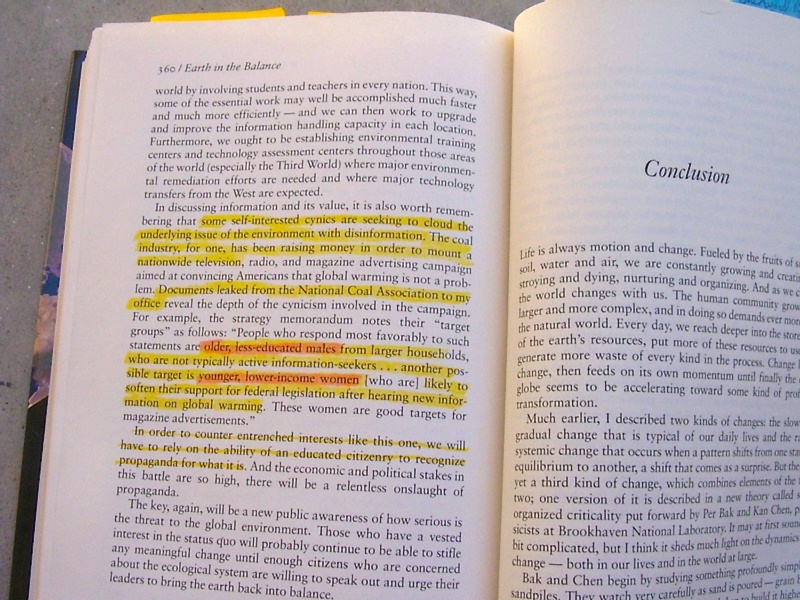 In the 1993 updated version of “Gaia, An Atlas of Planet Management”, a sidebar paragraph slightly alters the strategy phrase by adding “ing” to the first word and an extra “a” near the end, but otherwise keeps the parentheses around the last bit, like the original ICE memo did. 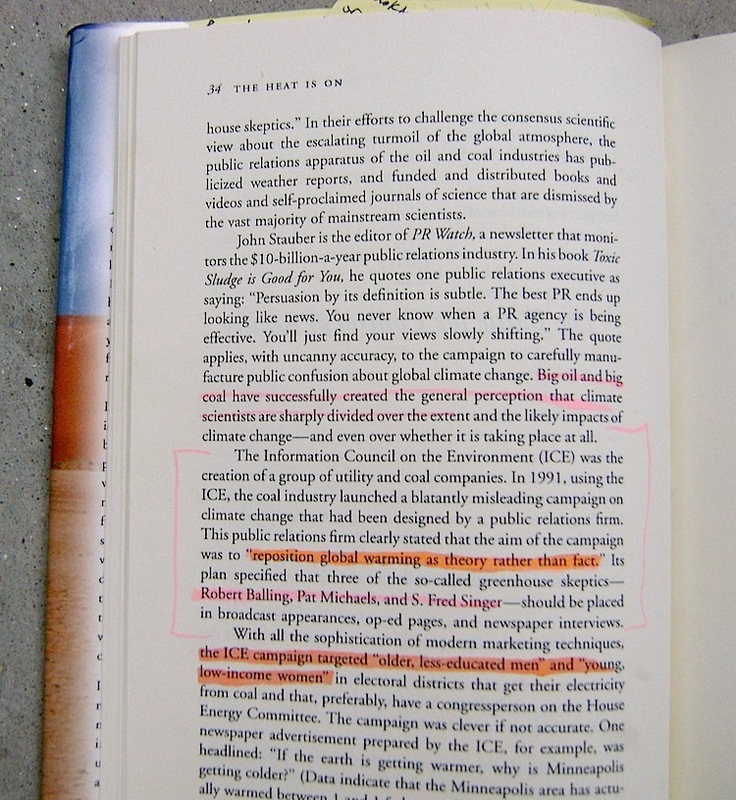 However, this book incorrectly names the ICE PR campaign as being the “Informed Citizens for the Environment“, a problem I detail at longer length here. Regrettably, this book offers not source for any material in it. 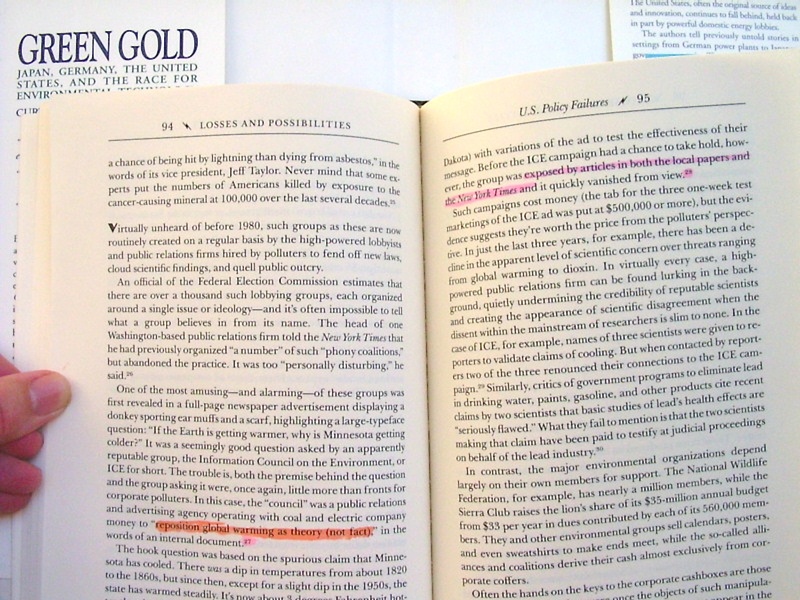 Curtis Moore’s and Alan Miller’s August 1994 book “Green Gold” cites the “reposition global warming” phrase from the July 8, 1991 NY Times article. However, Moore and Miller also must have seen the other ICE papers firsthand, as they mention an interview with a person cited in an ICE memo who is not named in the NYT article. 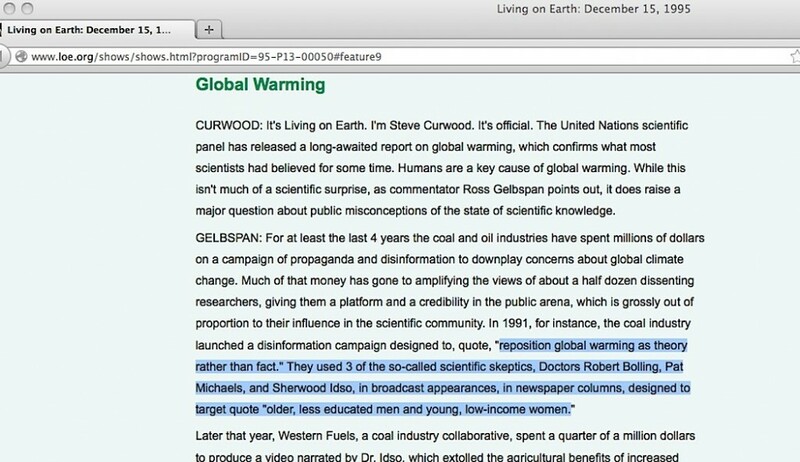 Ross Gelbspan’s first mention of the “reposition global warming” phrase that I can find happens during a December 15, 1995 Living on Earth National Public Radio interview. 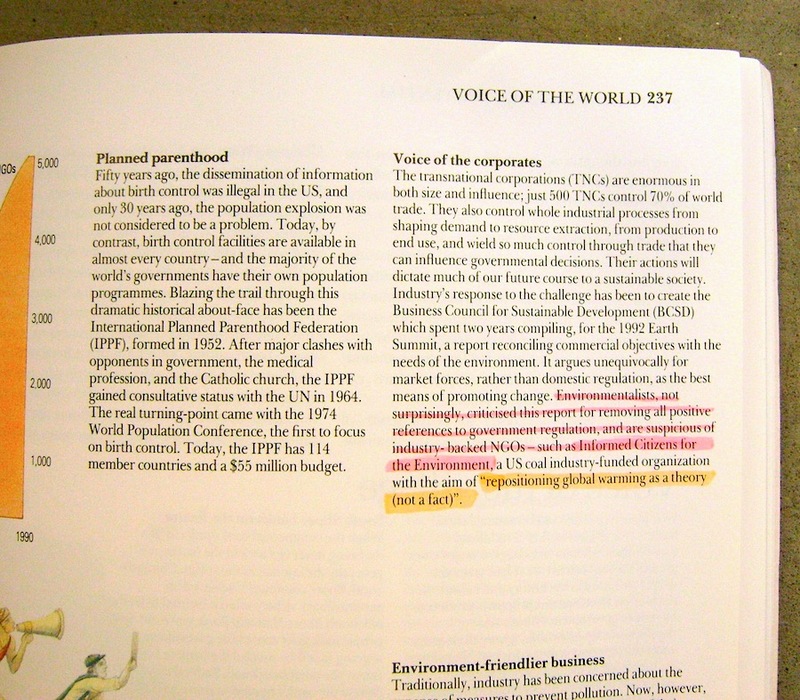 He also mentioned the “older, less educated men and young, low-income women” words, identical to what is seen in Gore’s “Earth in the Balance” book. 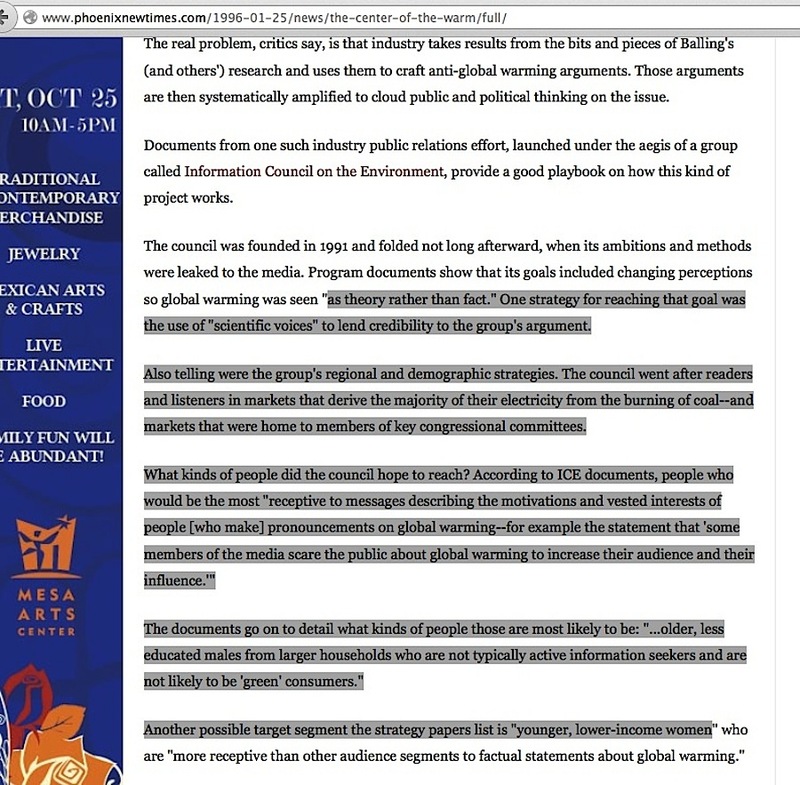 On January 25, 1996, The Phoenix New Times repeated the second half of the “reposition global warming” phrase along with the “older, less educated men and young, low-income women” words, and additionally provided other ICE memo phrases not found in Gelbspan’s radio interview…. months before the next entry below. 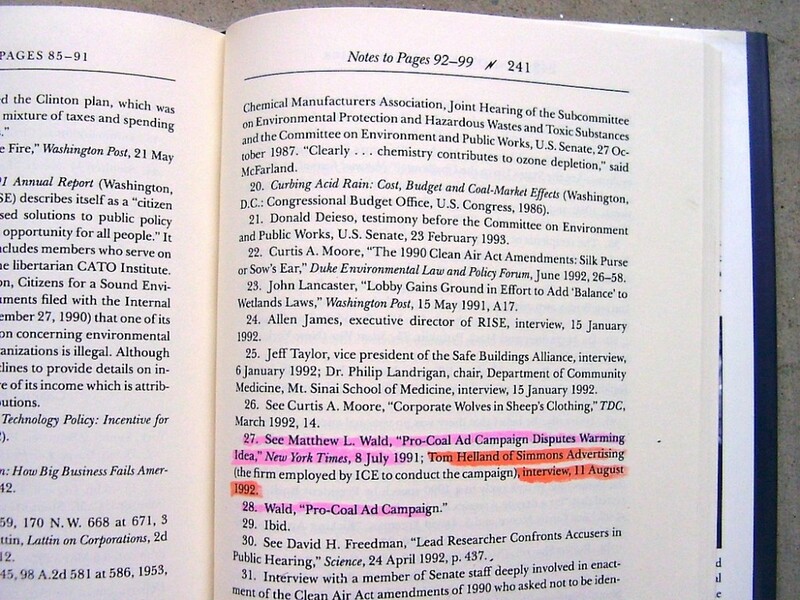 An April 1996 “Ties That Blind: Case Studies of Corporate Influence on Climate Change Policy” report by the enviro-activist group Ozone Action stated it and Ross Gelbspan “obtained” the ICE documents. 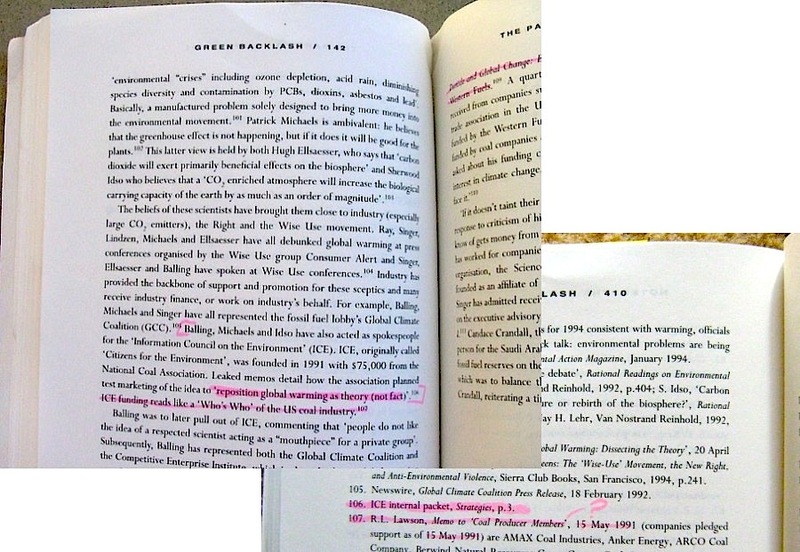 David Helvarg’s December 16, 1996 “Energy Companies Try the ‘Tobacco Approach’ to Evidence of Global Warming” article in The Nation (pages 3-4 here), like Rowell’s book above, quotes the “reposition global warming” phrase, but does not say where it came from. The unusual thing about Helvarg’s article is that he mentions the name of ICE’s PR director, something that only two other publications (that I’ve been able to find) do – one was an obscure November 1991 Oregon free enterprise newsletter, the other was the Flagstaff Arizona Daily Sun paper I noted in item #2 above. 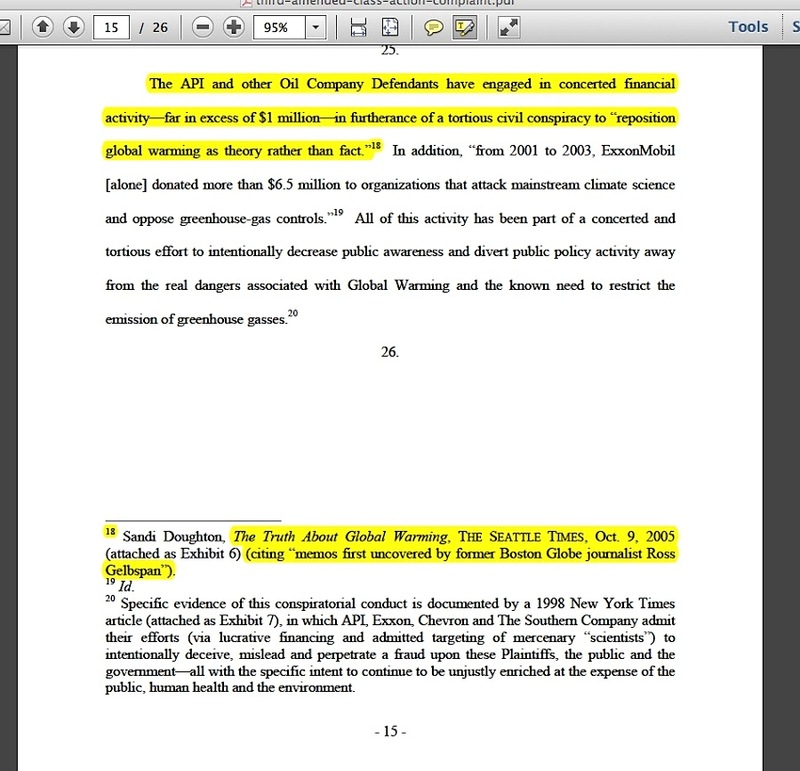 Mark Hertsgaard’s August 3, 1997 NY Times review of Gelbspan’s book stated, “…the fossil fuel lobby has achieved the goal stated in a 1991 planning memo unearthed by Gelbspan: to ‘reposition global warming as theory rather than fact.’ …No other reporter has told this story as comprehensively or explored its implications for human welfare as searchingly as Gelbspan, a Pulitzer Prize-winning journalist.” As seen in items 2 though 5, Gelbspan’s mention of the “reposition global warming” phrase occurred after those, and he is not a Pulitzer winner. 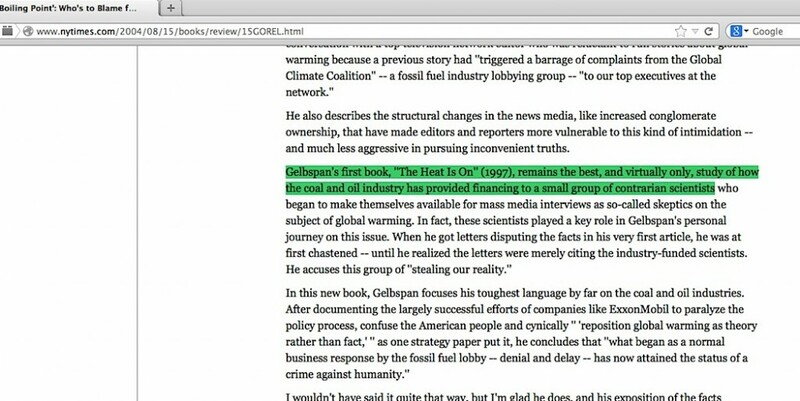 Gelbspan’s “Boiling Point” book was published in 2004 (it cites his 1997 book for the “reposition global warming” phrase), and Al Gore’s NY Times review of it said Gelbspan’s first book is “the best, and virtually only, study of how the coal and oil industry’ corrupts skeptic scientists.” One paragraph later, Gore said Gelbspan documented, “the largely successful efforts of companies like ExxonMobil to paralyze the policy process, confuse the American people and cynically ‘reposition global warming as theory rather than fact…’”. 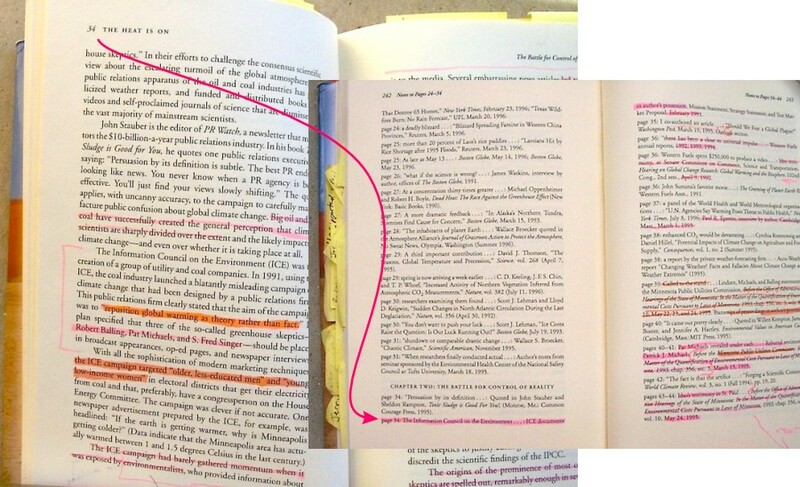 In a PBS Now April 22, 2005 broadcast, Gelbspan said, “This is some of the documents I gathered along the way that document this very, very cynical campaign of deception and disinformation….we got a copy of the strategy papers for that campaign. 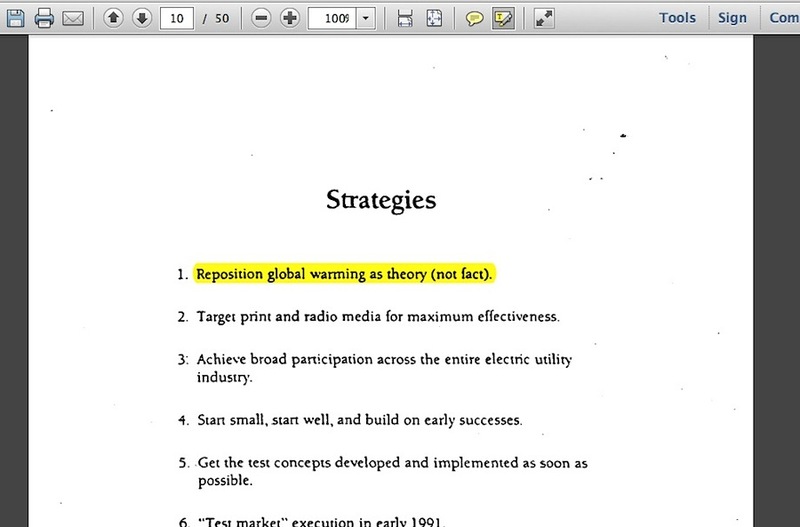 And it said that the purpose of the campaign was to “reposition global warming as theory rather than fact”. 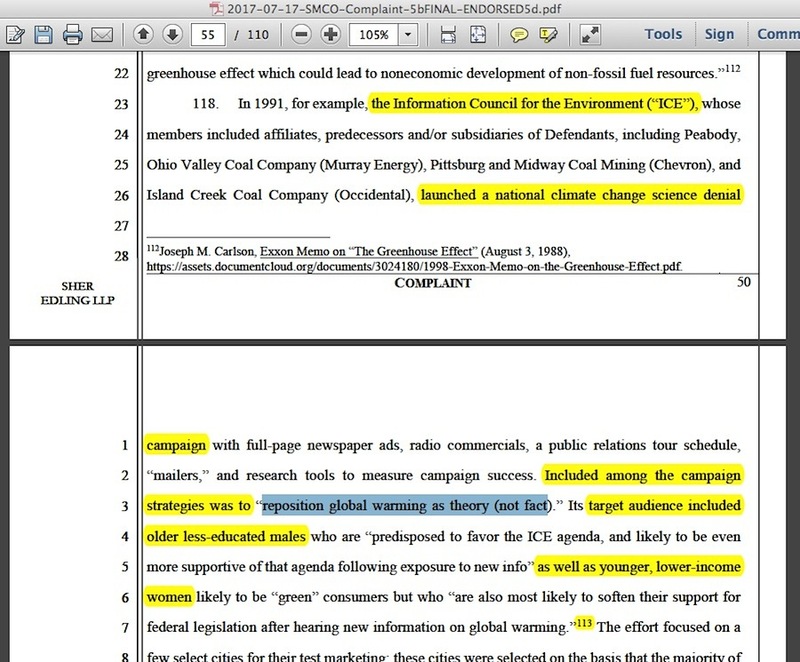 The Comer v. Murphy Oil (Third Amended Class Action Complaint February 23 2006 global warming nuisance court case cited the “reposition” phrase – more details about that situation here. 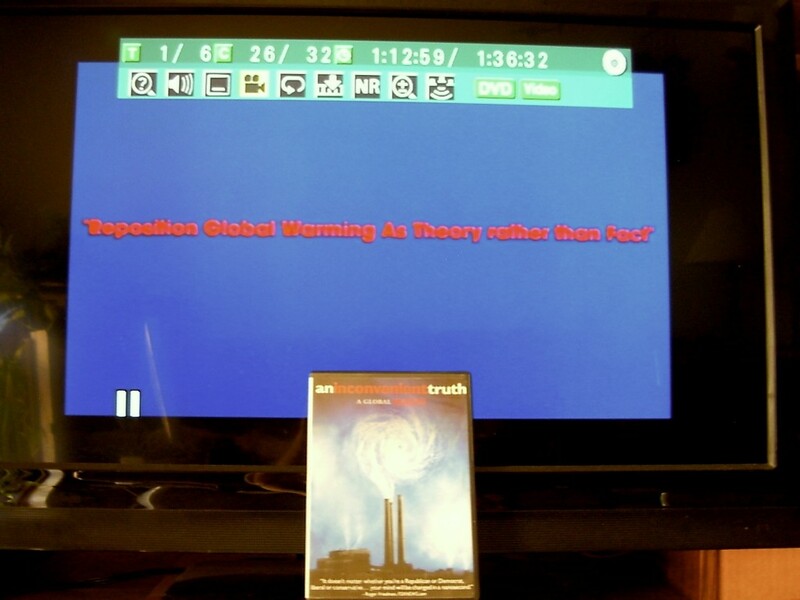 Gore’s 2006 “An Inconvenient Truth” movie spells out the “reposition global warming” phrase full screen in red letters just before its 1 hour 13 minute point. 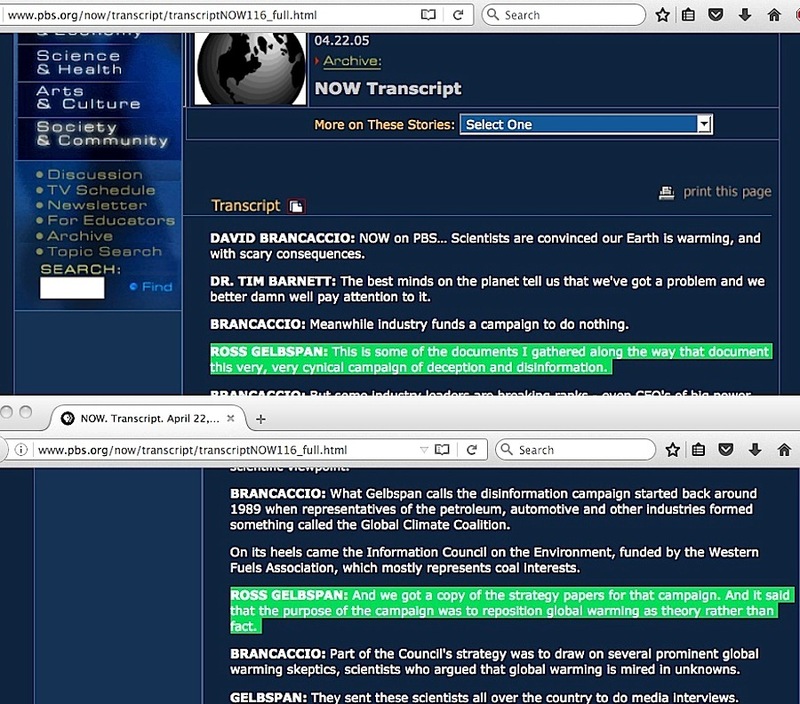 The companion book for the movie says Gelbspan was the discoverer of the phrase. 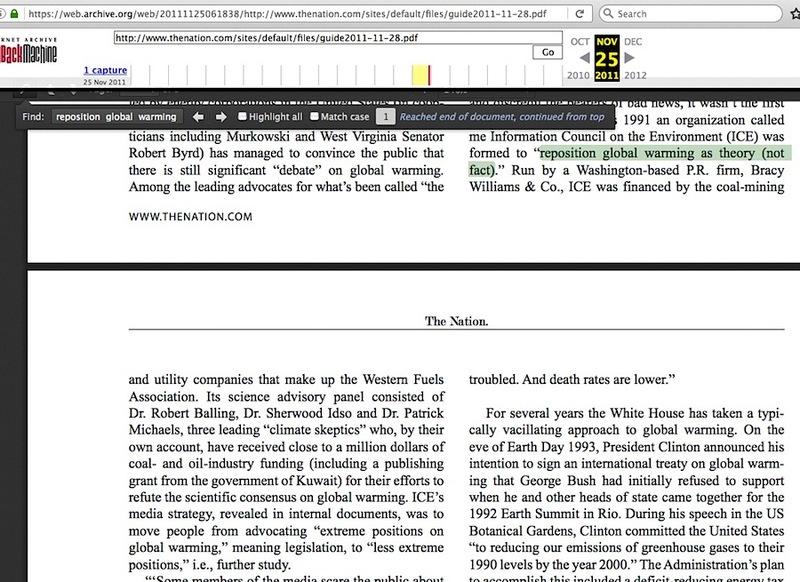 Mark Hertsgaard’s May 2006 “While Washington Slept” Vanity Fair article is published, with what appears to be an unequivocal statement that the “reposition global warming” phrase originates from the Global Climate Coalition (GCC), a mistake that is repeated at Wikipedia from 2006 to 2008, thus prompting other mistaken repetitions of that association worldwide. Wikipedia removed it when a critic forcefully pointed out how unsupportable the association was. 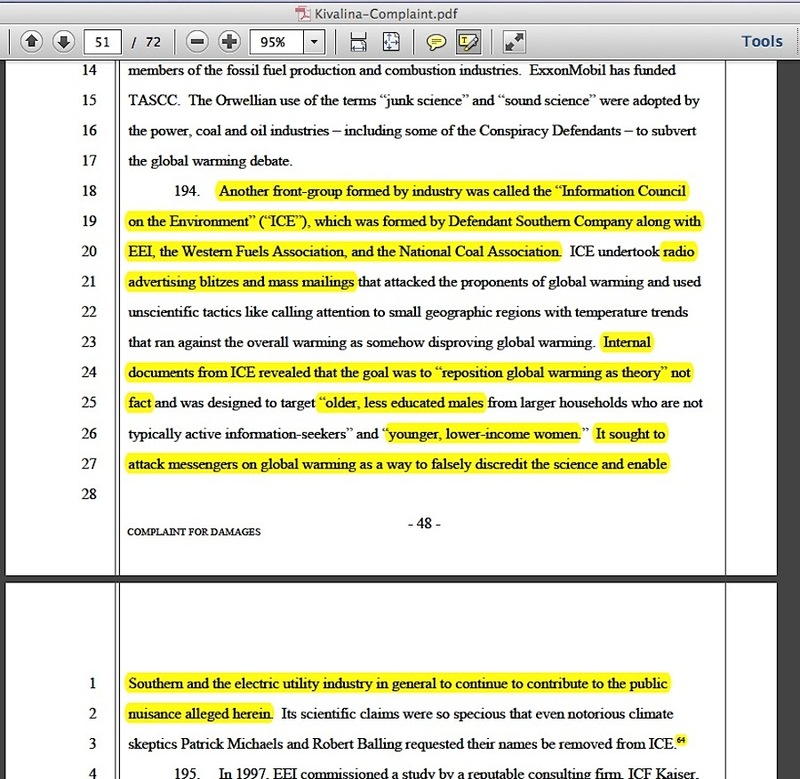 The Kivalina v. ExxonMobil Corp., Et al. 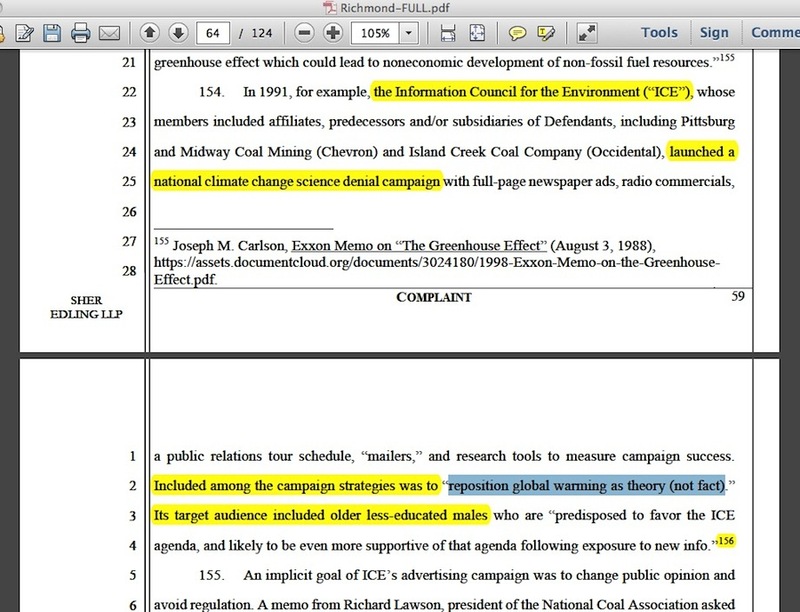 (February 26, 2008) global warming nuisance court case cited the strategy/targeting memo phrases – more details about that situation here. 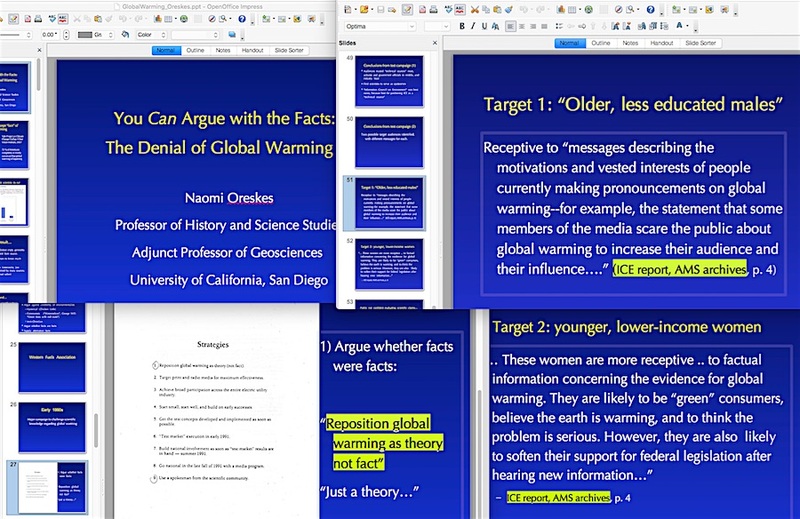 Naomi Oreskes 2008 Powerpoint presentation quoted the strategy/targeting phrases, noting they were archived at place where, it turns out, they never were. 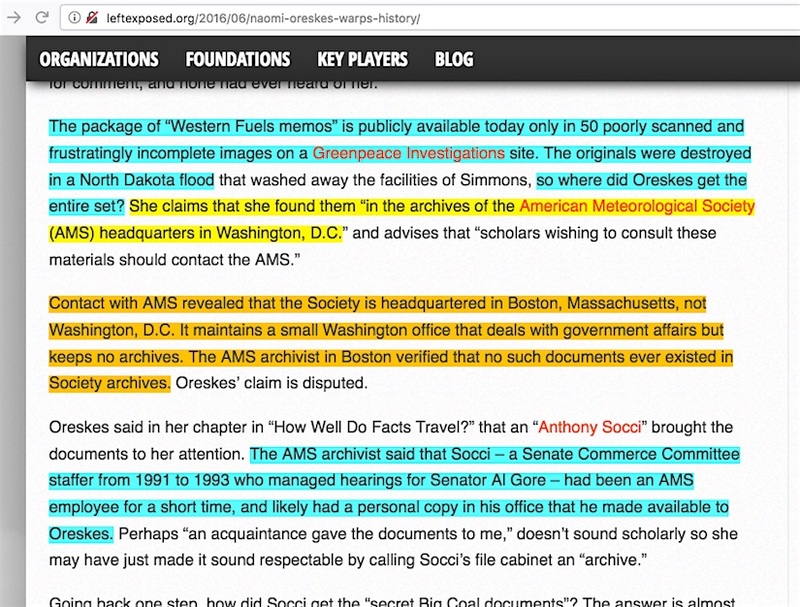 The Union of Concerned Scientists “The Climate Deception Dossiers” web page features a handy infographic of the “reposition global warming” phrase, and a link to their downloadable PDF file of old Western Fuels ICE campaign memo scans, which is 100% identical to Greenpeace’s scan collection (which I linked to in item #1), after, of course, the deletion of the page 1 Ozone Action summary. 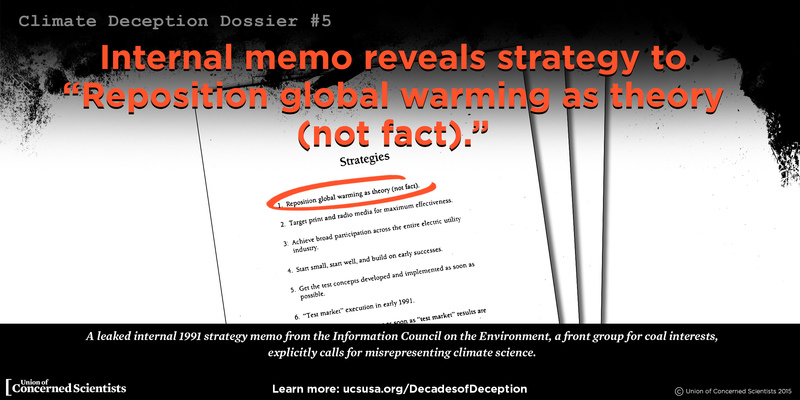 As I noted in my June 10, 2013 blog post, nobody else (with one oddball exception) could bring themselves to point directly to Greenpeace’s “ICE memo collection” over the last two decades, and UCS only adds to this streak in a really strange way. 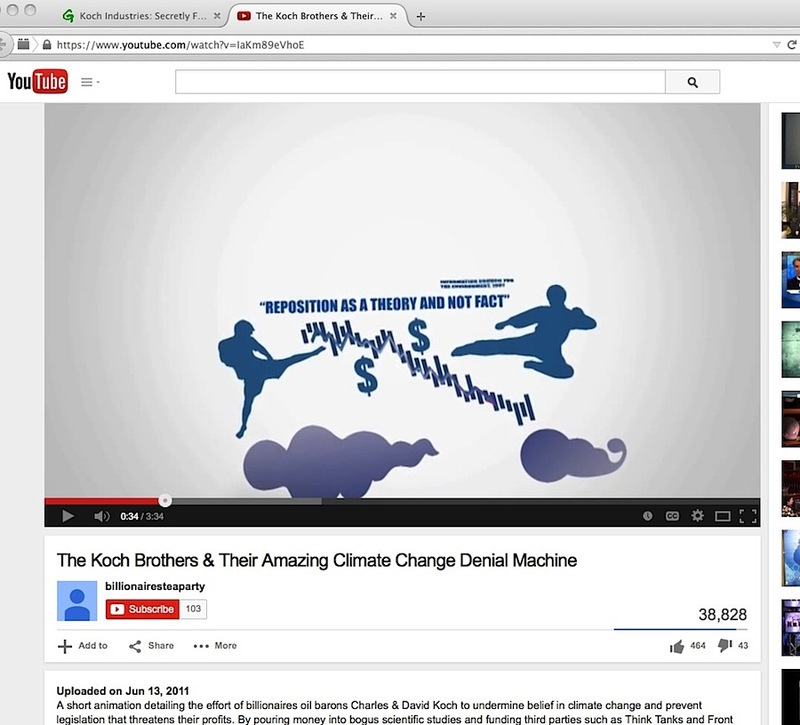 A Greenpeace page prominently features its Koch Brothers Youtube video which attempts to portray the “reposition global warming” phrase as a sinister plot hatched by “industries” to hoodwink the public, which I detailed in this blog post. The trio of “San Mateo / Marin / Imperial Beach v. Chevron Corp. et al.” court cases filed in California in July 2017 cited the ‘strategy/targeting memo phrases,’ which I detailed at further length here. The trio of “Santa Cruz County/City / Richmond v. Chevron Corp. et al.” court cases filed in California in December 2017/January 2018 cited the ‘strategy and (partial) targeting memo phrases,’ which I detailed at further length here. Two additional court cases filed in July 2018, “State of Rhode Island” and “City of Baltimore” continue the trend of quoting the strategy/targeting phrases. 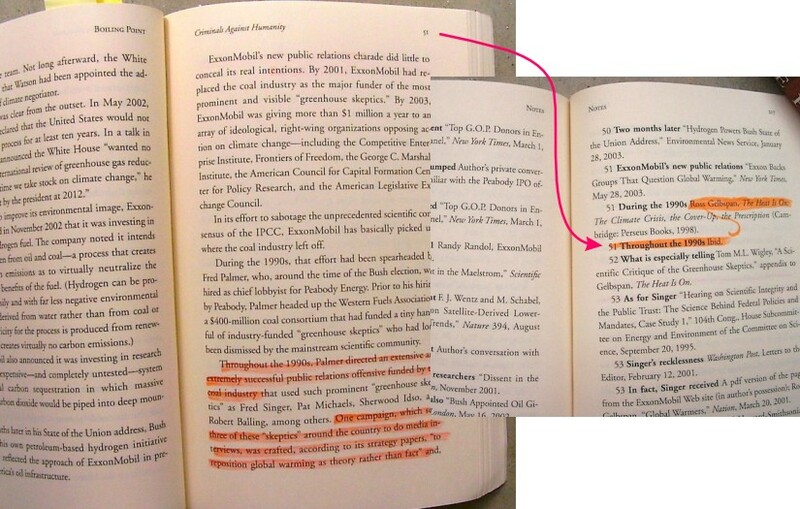 The “reposition global warming” phrase can only be evidence of a cynical quid pro quo arrangement when it is accompanied by proof that skeptic climate scientists were paid industry money in exchange for lies intended to downplay the harm of man-caused global warming. When it is seen to be filled with irreconcilable faults and strangely shared talking points, it’s worthy of a much deeper look into why those problems are there. 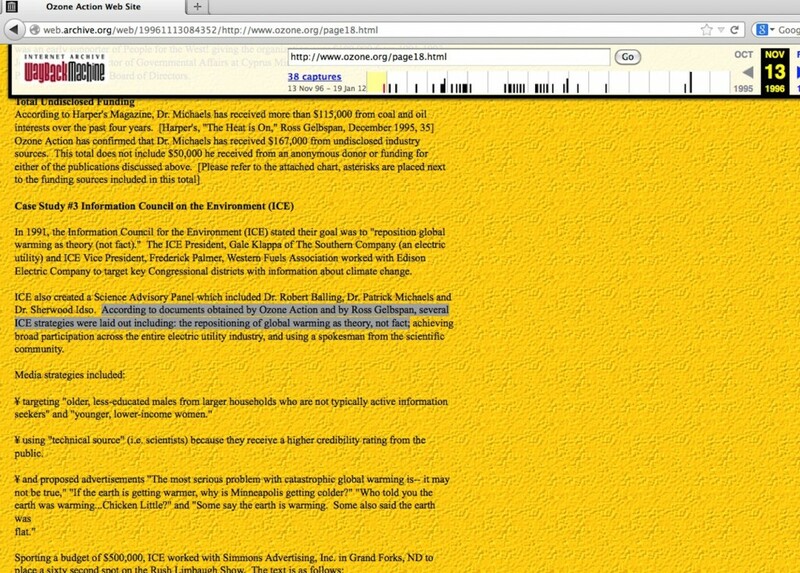 This entry was posted in Information Council for the Environment, Narrative derailment, Repeated talking points, Timeline inconsistencies, Western Fuels Association and tagged Al Gore, Alan Miller, Andrew Rowell, Curtis Moore, David Helvarg, Mark Hertsgaard, Naomi Oreskes, Phil Shabecoff, Union of Concerned Scientists, Western Fuels Association by Russell Cook. Bookmark the permalink.